Having winter tires on your car can improve its performance in snowy or extremely cold conditions when compared to all-season tires. While most cars and trucks leave the factory with all-season tires, having a second set of tires for the winter could provide many benefits. 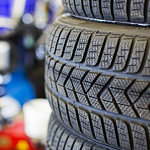 Winter tires are made of a softer rubber that stays supple at extremely low temperatures. Combined with a deep tread pattern with many biting edges, they will provide you with a higher level of control when it's snowy or slushy outside. Because winter tires will wear down quickly if used excessively on pavement, they should be replaced with all-season tires during the warmer and dryer months of the year. These tires are made of a harder and more durable rubber. At Wagner Kia of Shrewsbury, we take the stress out of swapping your tires during the year. We'll make sure you have the right tires for the conditions.